Lignocellulosic biomass is highly recalcitrant and various pretreatment techniques are needed to facilitate its effective enzymatic hydrolysis to produce sugars for further conversion to bio-based chemicals. Ionic liquids (ILs) are of interest in pretreatment because of their potential to dissolve lignocellulosic materials including crystalline cellulose. Four imidazolium-based ionic liquids (ILs) ([C=C2C1im][MeCO2], [C4C1im][MeCO2], [C4C1im][Cl], and [C4C1im][HSO4]) well known for their capability to dissolve lignocellulosic species were synthesized and then used for pretreatment of substrates prior to enzymatic hydrolysis. In order to achieve a broad evaluation, seven cellulosic, hemicellulosic and lignocellulosic substrates, crystalline as well as amorphous, were selected. The lignocellulosic substrates included hybrid aspen and Norway spruce. The monosaccharides in the enzymatic hydrolysate were determined using high-performance anion-exchange chromatography. 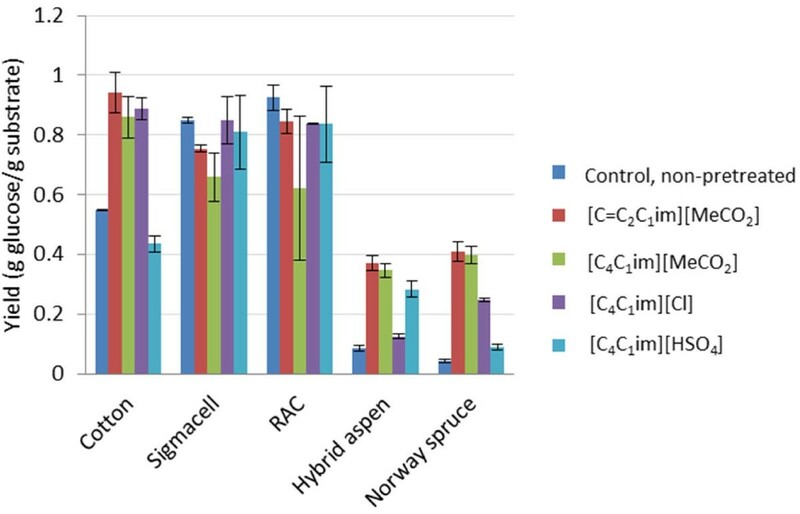 The best results, as judged by the saccharification efficiency, were achieved with [C4C1im][Cl] for cellulosic substrates and with the acetate-based ILs for hybrid aspen and Norway spruce. After pretreatment with acetate-based ILs, the conversion to glucose of glucan in recalcitrant softwood lignocellulose reached similar levels as obtained with pure crystalline and amorphous cellulosic substrates. IL pretreatment of lignocellulose resulted in sugar yields comparable with that obtained with acidic pretreatment. Heterogeneous dissolution with [C4C1im][HSO4] gave promising results with aspen, the less recalcitrant of the two types of lignocellulose included in the investigation. The ability of ILs to dissolve lignocellulosic biomass under gentle conditions and with little or no by-product formation contributes to making them highly interesting alternatives for pretreatment in processes where high product yields are of critical importance. As petroleum and other fossil resources are not sustainable, renewable alternatives are needed for production of fuels, chemicals, and materials. Lignocellulosic biomass is an abundant non-food renewable resource that can contribute to a shift towards a sustainable bio-based society . The three major constituents of lignocellulosic biomass are cellulose, hemicelluloses, and lignin. Cellulose and hemicelluloses are polysaccharides that can be hydrolyzed to monosaccharide sugars. The monosaccharides obtained can then be utilized for production of ethanol or other commodities . Saccharification is typically accomplished through enzymatic hydrolysis, as the high selectivity of enzymatic catalysis gives high sugar yields. A pretreatment step is needed to achieve efficient bioconversion of lignocellulosic feedstocks, as the cellulose fraction is not easily accessible to enzymes [3, 4]. However, many pretreatment methods require harsh conditions and give rise to by-products, which decrease the sugar yields and inhibit enzymatic and microbial biocatalysts. Solvents that dissolve cellulose are of interest for pretreatment of lignocellulosic feedstocks prior to bioconversion. In nature, cellulose occurs mainly as highly crystalline cellulose I . The crystallinity may prevent efficient enzymatic conversion and it is therefore desirable to disrupt the structure of the cellulose. Since cellulose is amphiphilic [6, 7], it has been suggested that both hydrophobic and hydrophilic interactions need to be broken to dissolve cellulose. Therefore, a suitable solvent system should contain a co-solvent that weakens the hydrophobic interactions in an aquatic environment . Several solvent systems for cellulose are known [9–14], but many of them suffer from problems like high toxicity and being difficult to recycle. Ionic liquids [ILs] are non-volatile solvents that can dissolve cellulose under gentle conditions. Several attempts have been made to utilize ILs for pretreatment of cellulose [15–19]. Aspects that have been studied include the inhibitory effect on enzymes [20–22], the influence of water content [23, 24] and cellulose load , the particle size of the biomass [26–28], the pretreatment temperature , and the pretreatment time . However, an extensive study on the pretreatment effects of different ILs on different types of cellulosic substrates is lacking. Comparisons have been made, but they are based on biomass from different sources and treatments performed under different conditions . Thus, the aim of this study was to investigate the pretreatment effect of different ILs on different types of substrates under identical conditions. Four ILs (Table 1) and seven substrates (Table 2) were studied. aThe yields were calculated for the total synthesis (two steps for all of the ILs except [C4C1im][Cl], which was synthesized in one step) starting from the substituted imidazoles. bNot Applicable. Linear cellulosic homopolysaccharide of β-D-glucopyranosyl units (95-99%), crystallinity: 64.9%, typical DP: 8,100 - 15,300. Linear cellulosic homopolysaccharide of β-D-glucopyranosyl units, crystallinity: 36.1%, DP: 209. Amorphous cellulosic homopolysaccharide prepared from Sigmacell Type 20 using phosphoric acid. This work/Prepared using method of Zhang et al..
Branched hemicellulosic heteropolysaccharide, typical DP of hardwood xylan: 100–200. Branched hemicellulosic heteropolysaccharide, DP: 900–1500. Hardwood lignocellulose, see Table 3. Softwood lignocellulose, see Table 3. The four ILs (Table 1) were chosen since they have been used to dissolve cellulosic substrates and are recognized for their performance in such applications. Also, the set studied would allow for the detection of performance variations between different types of ILs used for this purpose. [C4C1im][Cl] is one of the most studied ILs when it comes to dissolving cellulose and serves as a good reference [15, 17, 30, 37]. [C4C1im][HSO4] is highly interesting because it has been reported to dissolve lignin in high water content [10-40% (w/w) water], which is substantially more than [Cl]-- and [MeCO2]--based ILs can handle . [C4C1im][MeCO2] has the highest basicity among the selected [C4C1im]-based ILs, a property that is strongly linked to the capability of the IL to dissolve cellulose [30, 37]. Finally, [C=C2C1im][MeCO2] was selected because of its high reactivity, low viscosity, and ability to dissolve cellulose . It has been suggested that π-π interactions between the allyl side chain and lignin will improve lignin solubility . The set of ILs chosen also gives the possibility to investigate the effect of the cation, by comparing the results from [C=C2C1im][MeCO2] with those from [C4C1im][MeCO2]. With regard to dissolution of wood saw dust and thermo-mechanical wood pulp, the performance of 1-allyl-3-methylimidazolium chloride [C=C2C1im][Cl] even surpassed that of [C4C1im][Cl] . The set of ILs studied (Table 1) would also permit a comparison of ILs that are capable of homogeneous dissolution of lignocellulose, i.e. complete dissolution of all the main components of lignocellulose, and ILs known to be restricted to heterogeneous dissolution of lignocellulose . [C4C1im][MeCO2], [C4C1im][Cl] and [C=C2C1im][MeCO2] should give rise to homogeneous dissolution of lignocellulose (i.e. dissolve cellulose, hemicellulose and lignin). [C4C1im][HSO4] would effect heterogeneous dissolution of lignocellulose by selectively dissolving lignin and hemicellulose, but would not dissolve cellulose. The study included cellulosic (cotton, Sigmacell Type 20, and regenerated amorphous cellulose), hemicellulosic (xylan and galactomannan), as well as lignocellulosic (hybrid aspen and Norway spruce) substrates (Table 2). The selected collection of substrates differ widely with regard to fundamental properties, such as crystallinity, degree of polymerization (DP), and complexity (Table 2). The most complex substrates, aspen and spruce, represent hardwood and softwood, respectively. Softwood is typically the most recalcitrant type of lignocellulosic biomass . The sets of ILs and substrates used in the investigation would allow a broad evaluation of the ILs with regard to the effects of the anion and the cation as well as the importance of homogeneous and heterogeneous dissolution on the pretreatment efficiency. To permit a comparison of IL pretreatment with a conventional state-of-the-art pretreatment method, one of the lignocellulosic samples was also pretreated using classical sulfuric acid pretreatment. Using in-house prepared ILs and advanced analytical methods such as high-performance anion-exchange chromatography (HPAEC) to quantify different monosaccharides released from the polymeric substrates by the hydrolytic enzymes, this investigation addresses the lack of direct comparisons of the effects of ILs on cellulosic, hemicellulosic, and lignocellulosic samples. Data on the properties and synthesis of the four ionic liquids synthesized as a part of the investigation are shown in Table 1. Figure 1 shows the results of 1H and 13C NMR analysis of [C4C1im][MeCO2], [C4C1im][HSO4], [C4C1im][Cl], and [C=C2C1im][MeCO2]. The figure shows the peak assignments for the 1H NMR spectra. The clean spectra indicate that the ionic liquids were of high purity. Dialkylated imidazoles, such as [C4C1im][MeCO2], [C4C1im][HSO4] and [C4C1im][Cl] (Table 1), are among the more common cations used for the dissolution of biomass. In fact, 1-butyl-3-methylimidazolium chloride ([C4C1im][Cl]) was one of the first ILs used to dissolve cellulose  and lignocellulose . The focus has recently shifted from chloride-based to acetate-based ILs , which in this study are represented by [C4C1im][MeCO2] and [C=C2C1im][MeCO2] (Table 1). However, the stability of acetate-based ILs is not as good as that of chloride-based ILs, such as [C4C1im][Cl] (Table 1). 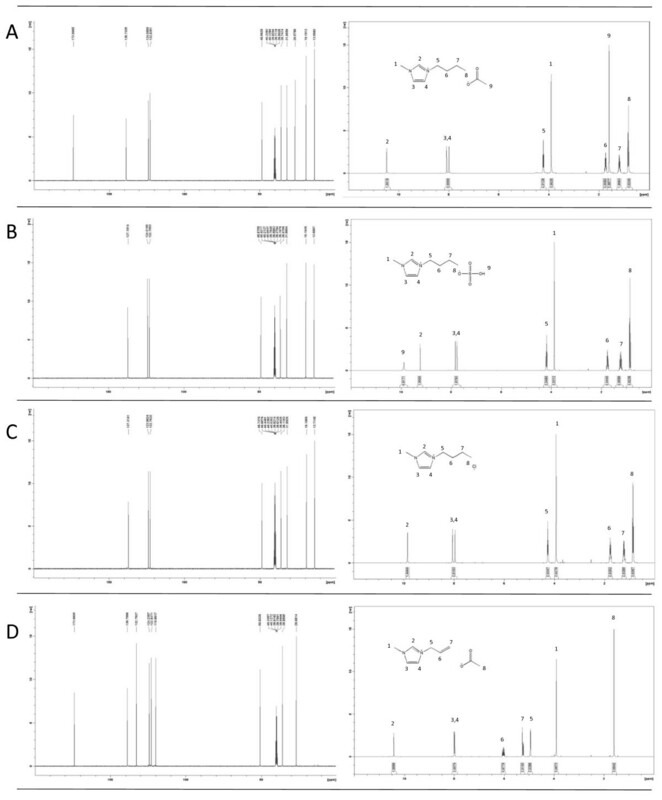 NMR analysis of ionic liqid preparations: (A) 1-butyl-3-methylimidazolium acetate, (B) 1-butyl-3-methylimidazolium hydrogen sulfate, (C) 1-butyl-3-methylimidazolium chloride, and (D) 1-allyl-3-methylimidazolium acetate. Data of 13C NMR (left side) and 1H NMR (right side) analysis are shown. The Kamlet-Taft polarity, or, more precisely, the hydrogen-bond basicity of the IL, is believed to be strongly linked to its capability to dissolve or to swell lignocellulose [23, 39]. However, the basicity of an IL is related to its hydrophilicity  and poses a problem which has to do with the water content of the IL. In equilibrium with air, ILs with acetate as anion can reach a water content of 27% (w/w) . However, even a relatively low content of water (3-5% (w/w) in a study of Miscanthus and 5-10% (w/w) in a study of maple-wood flour ) has been shown to have a negative effect on the solubility of lignocellulose. This is not optimal in a process, where the energy used for drying the biomass and the IL needs to be taken in to account. The water content of the ILs (Table 1) was determent by Karl-Fischer titration after the samples had been exposed to high vacuum (<50 mbar) at 65°C overnight. The water content of all ILs was below 0.16 wt%, except for [C4C1im][HSO4], which on purpose had a high water content. According to previous studies , the sugar yield from lignocellulose pretreated with [C4C1im][HSO4] was significantly higher when the water content was 10-40%. The water content of the [C4C1im][HSO4] used in our study, 20% (Table 1), is thus within the desired range. The yields of the ILs (Table 1) were calculated for the total synthesis starting from the corresponding 1-alkyl-imidazole (methyl and butyl). This explains why the yields were sometimes relatively low (Table 1). [C4C1im][MeCO2] and [C=C2C1im][MeCO2] were made from the corresponding saturated and unsaturated 1-alkyl-3-methylimidazolium chlorides. The ion exchange was tracked using NMR to ensure that the acetate ion was duly present and that the ion exchange was successful. The halide contamination was controlled by using HPAEC and a sodium chloride standard. The chloride contamination was <1% (Table 1). The amounts of structural carbohydrates and lignin were determined after extraction of the aspen and the spruce wood (Table 3). The values correspond well with those found in the literature . The glucan content of the aspen and spruce wood was rather similar, around 40% (Table 3). As expected, the aspen wood had a relatively high xylan content (16.6%), while the spruce wood had relatively high mannan content (10.4%). The total lignin content of Norway spruce (28.3%) was higher than that of hybrid aspen (23.4%). The lignin content is highly relevant for enzymatic hydrolysis of cellulose , as lignin can obstruct saccharification by forming a physical barrier, by catalytically unproductive binding of hydrolytic enzymes, and by formation of lignin-carbohydrate complexes (LCCs). aReported as g of carbohydrate or lignin per g of wood (dry weight) with standard deviations. bKlason lignin and acid-soluble lignin. Cellulosic, hemicellulosic and lignocellulosic samples (5% wt) were pretreated with the four ILs at 100°C for 20 h. The precipitation was carried out using a small amount of methanol and ultra-pure deionized water. The precipitate was collected by centrifugation and washed three times with ultra-pure water and once with citrate buffer prior to the enzymatic saccharification. The enzyme mixture used contains a wide variety of proteins, which are expected to degrade not only cellulose, but also xylan and mannan. The use of a sensitive analytical method for determination of the yields of the monosaccharides (HPAEC) would allow detection of small quantities of sugars such as xylose and mannose. The enzymatic saccharification was carried out analytically in a small scale (reactions with 50 mg sample), which made the processing of multiple parallel samples and the evaluation of the experiments using statistical analysis feasible. Compared to the untreated control, the glucose production rate [GPR, value based on the glucose concentration after 2 h before the reaction levels off (see Section Glucose concentration estimation)] of cotton increased dramatically after treatment with [C4C1im][Cl], [C4C1im][MeCO2], and [C=C2C1im][MeCO2] (Figure 2). For cellulosic samples, pretreatment with [C4C1im][Cl] gave the best results (Figure 2). The GPR increased significantly (P ≤ 5%, t-test) also for the [C4C1im][HSO4]-pretreated sample compared to that of the control sample. Compared to the untreated control, the glucose yield [value based on the glucose concentration after 72 h, when the reaction has leveled off (see Section Analysis of monosaccharide yields)] increased significantly after pretreatment with all of the ILs except [C4C1im][HSO4] (Figure 3). Pretreatment of cotton with [C4C1im][MeCO2], [C=C2C1im][MeCO2] and [C4C1im][Cl] increased the yield with 160, 170 and 160%, respectively. The difference can be attributed to that [C4C1im][HSO4] causes heterogeneous dissolution of lignocellulose, while the other three ILs cause homogeneous dissolution. As cotton consists almost of pure cellulose (Table 2), the capacity of [C4C1im][HSO4] to dissolve lignin and hemicellulose would be of little or no help. For [C4C1im][MeCO2], [C=C2C1im][MeCO2] and [C4C1im][Cl], the increase in GPR (Figure 2) was higher than the increase in yield (Figure 3), which indicates that the effect of the pretreatment is most beneficial for the initial phase of the hydrolysis of the cellulose. Glucose production rate (GPR) in g glucose l -1 h -1 after 2 h of enzymatic hydrolysis (before the reaction rates level off) for the ionic-liquid-pretreated samples and the non-pretreated control. The glucose yield in g glucose g substrate -1 after 72 h of enzymatic hydrolysis (at the end of the reactions after that the reaction rates level off) of ionic-liquid-pretreated samples and non-pretreated control. With regard to the microcrystalline Sigmacell Type 20 cellulose, the GPRs of samples pretreated with [C4C1im][Cl], [C4C1im][MeCO2] and [C=C2C1im][MeCO2] were significantly higher (P ≤ 5%, t-test) than that of the control (Figure 2). The glucose yields of pretreated and non-pretreated samples did not exhibit any significant differences (Figure 3). Treatment with [C4C1im][HSO4] did not result in any improvement for either the GPR or the glucose yield, as could be expected since [C4C1im][HSO4] does not dissolve cellulose. When untreated Sigmacell Type 20 was used as substrate instead of untreated cotton, the GPR increased from 0.41 g l-1 h-1 to 2.72 g l-1 h-1 and the glucose yield increased from 0.55 g g-1 to 0.85 g g-1. Evidently, the Sigmacell Type 20 cellulose was more susceptible to enzymatic hydrolysis than cotton cellulose. The difference can probably be attributed to the much lower degree of polymerization (DP) of Sigmacell Type 20 compared to cotton (Table 2), which would give the exo-acting cellobiohydrolases a larger number of cellulose chain ends to attack. It is also possible that a lower degree of crystallinity of Sigmacell Type 20 cellulose (Table 2) contributes to facilitating the enzymatic hydrolysis. After pretreatment of cotton with [C4C1im][Cl], [C4C1im][MeCO2] or [C=C2C1im][MeCO2], the GPR values were similar or slightly higher than the corresponding GPR values for Sigmacell Type 20 (Figure 2). This was not due to that the substrate had been exhausted already after 2 h, as less than 35% of the substrate had been converted to glucose. The yield values (Figure 3) from samples taken after 72 h were also lower than the theoretical maximum, which would be approx. 1.1 g glucose per g cellulose. The highest yield observed for the two cellulosic crystalline substrates, 0.94 g g-1, was obtained after pretreatment of cotton with [C=C2C1im][MeCO2] and corresponds to conversion of around 85% of the substrate to glucose. Thus, although the natural cotton was more recalcitrant than Sigmacell Type 20, pretreatment with all of the ionic liquids except [C4C1im][HSO4] removed that effect. The GPR values (Figure 2) and the glucose yield values (Figure 3) for regenerated amorphous cellulose (RAC) were rather similar to the values of the Sigmacell Type 20 cellulose that the RAC was derived from. This suggests that the crystallinity of the Sigmacell Type 20 cellulose (Table 2) was not an obstacle for the enzymatic hydrolysis. Apart from conversion of crystalline cellulose to amorphous, treatment with acid may potentially also result in hydrolysis which could give decreased cellulose chain length, but evidently this did not lead to improved hydrolysis of RAC compared to Sigmacell Type 20 under the experimental conditions studied. Enzymatic hydrolysis of untreated or IL-pretreated hemicellulosic samples for 72 h resulted in very low yields (<0.05 g g-1) of glucose and arabinose. Enzymatic hydrolysis of untreated beech-wood xylan gave a xylose yield of 0.55 ± 0.09 g g-1, while untreated locust bean gum galactomannan gave a galactose yield of 0.18 ± 0.01 g g-1 and a mannose yield of 0.54 ± 0.03 g g-1. After pretreatment of the beech-wood xylan with ILs, the xylose yields compared to that of the untreated control were 23% for [C=C2C1im][MeCO2], 25% for [C4C1im][MeCO2], 39% for [C4C1im][Cl], and 7% for [C4C1im][HSO4]. For the locust bean gum galactomannan, the galactose yields compared to that of the untreated control were 33% for [C=C2C1im][MeCO2], 75% for [C4C1im][MeCO2], and 66% for [C4C1im][Cl]. No galactose was recovered from galactomannan pretreated with [C4C1im][HSO4]. Finally, the mannose yields compared to that of the untreated galactomannan control were 91% for [C4C1im][MeCO2], 73% for [C4C1im][Cl], and 3% for [C4C1im][HSO4]. No mannose was recovered after pretreatment of galactomannan with [C=C2C1im][MeCO2]. Thus, the recovery of hemicellulose sugars after pretreatment with ILs was always poor. A possible explanation for poor recovery of hemicellulosic sugars is that previous studies have shown that ILs with a high basicity will hydrolyze hemicellulose to oligomeric sugars . It has also been shown that sulfate-based ILs, especially [HSO4]-, will hydrolyze hemicellulose to monomeric sugars and even dehydrate pentose sugars to furfural . Poor recovery of hemicellulose sugars has also been indicated in previous studies . As expected considering the recalcitrance of softwood, untreated Norway spruce exhibited lower GPR (0.28 ± 0.02 g l-1 h-1) and glucose yield (0.043 ± 0.006 g g-1) than untreated hybrid aspen (GPR, 0.62 ± 0.04 g l-1 h-1; glucose yield, 0.085 ± 0.01 g g-1). Pretreatment of the wood samples with the four ILs resulted in significantly higher (P ≤ 5%, t-test) GPR values and glucose yields (Figures 2 and 3). The increase of the yields (Figure 3) varied between 150 and 950% compared to that of the untreated wood samples. The highest yields were obtained upon use of [C4C1im][MeCO2] and [C=C2C1im][MeCO2] (Figure 3). For aspen, the glucose yields with [C4C1im][MeCO2] and [C=C2C1im][MeCO2] were 0.35 ± 0.02 g g-1 and 0.37 ± 0.02 g g-1, respectively. These yields were slightly higher than that achieved in a control experiment with dilute sulfuric acid pretreatment and enzymatic hydrolysis of aspen, which resulted in a glucose yield of 0.31 ± 0.05 g g-1. For aspen, the glucan conversion after pretreatment with [C4C1im][MeCO2] and [C=C2C1im][MeCO2] was 76% and 81%, respectively. When spruce was pretreated using [C4C1im][MeCO2] or [C=C2C1im][MeCO2], more than 90% of the glucan was converted to glucose. That is a higher value than achieved with the pure cellulosic crystalline and amorphous substrates, which indicates the potential of using ILs for pretreatment of lignocellulose. The glucose yields after pretreatment of aspen with the ILs that did not have acetate as anion were lower and corresponded to 0.28 ± 0.03 g g-1 for [C4C1im][HSO4] and 0.13 ± 0.01 g g-1 for [C4C1im][Cl]. The glucan conversions after pretreatment of aspen with [C4C1im][Cl] and [C4C1im][HSO4] were 28% and 62%, respectively. The corresponding values for spruce were 57% and 20%. While [C4C1im][HSO4] did not work very well for pretreatment of the recalcitrant spruce wood, the results obtained with aspen were not far behind the results achieved with acetate-based ILs (Figures 2 and 3). There were no significant differences between [C4C1im][MeCO2] and [C=C2C1im][MeCO2] in terms of pretreatment of any of the samples in this study. This indicates that the choice of cation is often not decisive in terms of the efficiency of the pretreatment process. The higher yields obtained upon use of ionic liquids with an acetate anion can most likely be explained by the higher basicity of the acetate compared to the chloride and hydrogen sulfate (reviewed by Brandt et al.). The comparatively low yields found for the hydrogen sulfate anion compared to the acetates can be attributed to the fact that it does not dissolve cellulose. However, it does dissolve lignin and hemicelluloses, which would explain the higher yields achieved compared to non-pretreated wood samples. Four ILs were evaluated for pretreatment of seven cellulosic, hemicellulosic and lignocellulosic substrates prior to enzymatic saccharification. The wide variety of substrates investigated and the use of the same pretreatment conditions for all ILs studied facilitated comparisons of the performance of the different ILs. Although they were not the most efficient pretreatment agents for simple cellulosic substrates, ILs with acetate as anion gave the best results for complex lignocellulosic substrates from wood. However, among the ILs used in this study the ones with acetate as anion are among the least stable. Moreover, they are cumbersome to synthesize, and they are sensitive to moisture. The halide-based IL [C4C1im][Cl] performed very well for simple cellulosic substrates, but was less efficient for pretreatment of wood. [C4C1im][Cl] possesses advantages from the process perspective, since it is easy to synthesize, relatively stable, and less sensitive to moisture than the acetate-based ILs. Disadvantages with [C4C1im][Cl] include its high melting point and high viscosity. The difference between homogeneous and heterogeneous dissolution of lignocellulose was studied by the inclusion of [C4C1im][HSO4] in the set of ILs studied. Homogeneous dissolution was not always better, as [C4C1im][HSO4] gave better results than [C4C1im][Cl] with hybrid aspen, the less recalcitrant type of lignocellulose included in the study. This warrants further attention in future studies, for example by optimization of the pretreatment process. 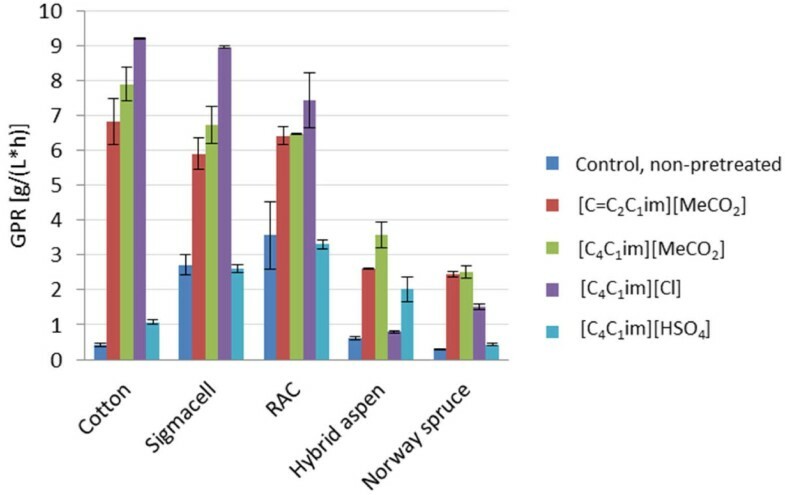 The best choices, as judged by the saccharification efficiency, appeared to be [C4C1im][Cl] for cellulosic substrates, acetate-based ILs or [C4C1im][HSO4] for hybrid aspen, and acetate-based ILs for Norway spruce. Pretreatment can, however, involve high water content, something that has always been a problem with homogeneous dissolution of lignocellulose. The possibility to include water and the stability of [C4C1im][HSO4] have potential to decrease the cost for the regeneration process. Therefore other factors than the capacity to dissolve cellulose, such as IL stability, the possibility to include water, and regeneration of the IL, need to be considered when choosing ILs that are most suited for industrial pretreatment. Conversion of crystalline Sigmacell Type 20 cellulose to RAC did not improve enzymatic hydrolysis. This was shown for both non-pretreated cellulose and cellulose that was pretreated with different ILs. ILs that enhanced hydrolysis of the crystalline form also enhanced hydrolysis of the RAC. Pretreatment with ILs gave sugar yields comparable with those obtained with acidic pretreatment technique. Pretreatment with ILs can be performed using gentle conditions, while acidic pretreatment is typically performed at high temperature and high pressure, and in a corrosive environment, factors that increase the demands on the quality of the process equipment and contributes to lower yields due to the formation of by-products from the lignocellulose feed. High yields are critical in the production of biofuels and other bulk chemicals. ILs also have low vapor pressure which is advantageous with regard to safety and environmental aspects. Thus, provided that ILs used in industrial processes can be reused, there are distinct advantages that make further research on the use of ILs for conversion of lignocellulose worthwhile. Future areas of research include recycling of ILs, up-scaling, process integration, and techno-economical assessment. 1-Methylimidazole (Sigma-Aldrich, 99%) and 1-butylimidazole (Aldrich, 99%) were distilled under vacuum from potassium hydroxide (Akzo Nobel, 87.9%). 1-Chlorobutane (Acros Organics, 99%), allyl chloride (Aldrich, 99%) and dimethylsulfate (Fluka, 95%) were distilled from CaO (Sigma-Aldrich). Ethyl acetate (Fisher Chemicals HPLC) and acetonitrile (Fisher Chemicals HPLC) were dried by running them through neutral aluminum oxide 90 (Merck 70–230 mesh ASTM) and toluene (Sigma-Aldrich, 99.7%) through silica (Acros Organics, Ultrapure 40–60 μm, 60A). All starting materials were used within hours of preparation. All reactions and washing procedures were carried out in dry glassware with dried chemicals and under inert atmosphere (argon) if not stated otherwise or in the case where water was used. 1-Methylimidazole (99 ml, 1.2 mol) was dissolved in 150 ml ethyl acetate and stirred at room temperature. 1-Chlorobutane (130 ml, 1.2 mol) was added dropwise to the reaction mixture and afterwards the reaction mixture was refluxed at 75°C for 4 days. The reaction vessel was allowed to cool at room temperature and was then thoroughly sealed and was kept at -20°C overnight. The upper organic layer was then removed using Schlenk techniques and the bottom IL layer was washed two times with 75 ml ethyl acetate. After the first wash, the IL precipitated into white crystals that were then dissolved in approximately 50 ml of acetonitrile and were recrystallized overnight at -20°C. The upper organic layer was again removed, and the crystals were washed three times with 50 ml of ethyl acetate and dried overnight using vacuum treatment in order to remove the last of the solvents. The yield was 48%. Allyl chloride (116 ml, 1.43 mol) was added dropwise to 1-methylimidazole (92 ml, 1.14 mol) under stirring and cooled in an ice-bath. Afterwards the reaction mixture was refluxed for 14 h at which point the reflux condenser was replaced with a distillation head and the reaction mixture was vacuum-distilled to give an amber-colored viscous liquid. The yield was 96%. [C=C2C1im][MeCO2] was prepared from [C=C2C1im][Cl] by using an ion-exchange column. A dispersion of Amberlite IRA-400 (OH- form) ion-exchange resin (64 g; enough to support the conversion of 20 g [C4C1im][Cl]) was prepared in deionized water and poured into a glass column (3 cm internal diameter). The Amberlite column was then loaded with [MeCO2]- by running through 1000 ml of a 1 M aqueous solution of [Na][MeCO2] with a flow-rate of 0.8 ml/min. Once the correct ion was loaded on the column, 15.2 g of [C=C2C1im][Cl] was dissolved in 100 ml of deionized water and poured on the Amberlite column and the flow-rate was set to 0.2 ml/min. When all the [C=C2C1im][Cl] aqueous solution had passed into the column, another 10 ml of water was added and were allowed to run through in the same flow-rate. Fractions were collected during this time and analyses with HPAEC were performed to determine the chloride content. All fractions were subjected to a drying process in evaporator and high vacuum overnight at 65°C under stirring to remove the water eluent. The chloride content was found to reside below 0.9% (mol/mol). Afterwards, the Amberlite column was rejuvenated with 1000 ml of a 1 M aqueous solution of sodium hydroxide with a flow-rate of 0.8 ml/min. The yield was 76%. 1-Butylimidazole (51 ml, 0.39 mol) was diluted in 60 ml toluene and cooled in an ice bath. Dimethyl sulfate (37 ml, 0.39 mol) was then added drop-wise (flow rate 0.5 drops/sec) and under stirring to the reaction mixture. Afterwards the reaction mixture was stirred for another hour at room temperature before the upper toluene layer was removed using Schlenk techniques. The lower IL layer was subsequently washed three times with 50 ml of toluene before it was dried overnight at 65°C under vacuum and stirring. The yield obtained was 89%. [C4C1im][MeSO4] (29.9 g) was diluted in 5 ml deionized water. The reaction vessel was kept open to the air and put in a heating block at 215°C. The internal temperature of the reaction mixture was continuously monitored and kept between 170 to 180°C for four hours by drop-wise addition of deionized water. Afterwards, the reaction mixture was cooled to 65°C and was kept under vacuum and stirring overnight to remove all residual water. The yield was 98%. Analyses by using 1H and 13C NMR were carried out on a Bruker DRX 400 MHz instrument with dimethyl sulfoxide (DMSO) as solvent. In all cases, the chemical shifts were calibrated from the solvent peak  (DMSO 1H 2.54, 13C 40.45). The water content of the ILs was determined using a Metrohm 756 KF coulometer with diaphragm-free titration cell and Hydranal Coulomat E reagent. After exposure to high vacuum at 65°C overnight, approximately 100 μl of the sample was withdrawn into a dry syringe which was then weighed. Subsequently, the sample was injected into the Karl-Fischer reactor and re-weighed to determine the amount of sample injected. Seven cellulosic and hemicellulosic substrates ranging from highly crystalline to amorphous were selected in order to achieve a broad evaluation. Wood samples included Norway spruce (kindly provided by SEKAB, Örnsköldsvik, Sweden) and hybrid aspen [kindly provided by the Umeå Plant Science Centre (UPSC), Umeå, Sweden]. Crystalline polysaccharides included cotton (Selefatrade AB, Spånga, Sweden) and Sigmacell Cellulose Type 20 (Sigma-Aldrich). Amorphous polysaccharides included beech-wood xylan (Sigma-Aldrich), galactomannan (locust bean gum, Sigma-Aldrich) and regenerated amorphous cellulose (prepared from Sigmacell cellulose Type 20 according to Zhang et al.). The wood samples, spruce and aspen, were milled using an IKA A11 Basic Analytical Mill and sieved (Retsch Analytical AS 200, 500–100 μm sieves). All cellulosic, hemicellulosic and lignocellulosic samples were preparatively dried using a vacuum pump until a dry matter content of ~100% was reached (Mettler Toledo HG63) thus avoiding water upon the IL pretreatment. Cellulosic samples (50 mg) were dispersed in 950 mg of ionic liquid and were then incubated for 20 hours at 100°C. The samples were allowed to cool to room temperature followed by the addition of up to 1 g of methanol in order to give a smoother initial precipitation. After that, 10 g of ultra-pure water (Millipore) was added followed by vigorous mixing and centrifugation for 10 min at 14,500 g (Eppendorf centrifuge 5810R). The supernatant was decanted and the biomass was subsequently washed using 3 × 10 g ultra-pure water and 1 × 10 g 50 mM citrate buffer pH 5.2 in a similar manner as previously stated. As a negative control, non-pretreated biomass was used. As a positive control, the milled and sieved aspen wood was pretreated at a combined severity of 2.2 using 1% (w/w) sulfuric acid as catalyst. The total weight of the reaction mixture was 1,670 mg and it contained 50 mg of the cellulosic/hemicellulosic sample, 50 mg enzyme mixture (a 1:1 ratio of a mixture of Celluclast 1.5 L and Novozyme 188, both of which were obtained from Sigma-Aldrich) and 50 mM citrate buffer (pH 5.2). The enzymatic hydrolysis was performed at 45°C in an orbital shaker set at 170 rpm (Ecotron incubator shaker, Infors). The samples (10 μl) were collected before enzyme addition (0 h), and after 2 h, 48 h and 72 h of enzymatic hydrolysis. During the hydrolysis (samples taken after 0, 2, 48, and 72 h, respectively) the concentration of glucose was estimated using a glucometer (Accu-Chek Aviva, Roche Diagnostics GmBH). The glucose concentrations after 2 h were used for calculation of the GPR (the glucose production rate), which is determined before the hydrolysis reaction levels off. The concentration of separate monosaccharides (arabinose, galactose, glucose, xylose, and mannose) was determined after 72 h of enzymatic hydrolysis using high-performance anion-exchange chromatography (HPAEC). A Dionex ICS-5000 equipped with an electrochemical detector, a CarboPac PA20 (3 × 30 mm) guard column and a CarboPac PA20 (3 × 150 mm) separation column (all from Dionex) were used to perform the analysis. Prior to analysis all samples were diluted using ultra-pure water and filtered through a 0.2 μm nylon membrane (Millipore). The concentrations determined with HPAEC were used for calculation of the monosaccharide yields, as the hydrolysis reactions had leveled off after 72 h.
The extractives were determined according to Lestander et al. with the exception that the extraction was performed in 15 cycles instead of during 1 h. After the extraction, the contents of carbohydrates (arabinan, galactan, glucan, mannan and xylan) and lignin (acid soluble and acid-insoluble lignin) were determined according to NREL/TP-510-42618  with the exception that the concentration of the monosaccharides was determined using HPAEC (according to the procedure described in Section Analysis of monosaccharide yields). JG is a doctoral student with focus on utilization of ionic liquids for conversion of lignocellulosic materials. SW is a postdoctoral researcher with interest in enzyme chemistry and technology. MN is a doctoral student with interest in the area of pretreatment and enzymatic saccharification of lignocellulose. LJJ is professor at Umeå University, and is working on biotechnology for biorefining of lignocellulosic feedstocks. He is also leader of the Biochemical Platform of the Bio4Energy research initiative (http://www.bio4energy.se). JPM is professor at Umeå University and Åbo Akademi University, and is working on ionic-liquid technologies and chemical catalysis for the biorefining of lignocellulose, e.g. within the Bio4Energy program. John Gräsvik, Sandra Winestrand contributed equally to this work. This research was supported by the Swedish Energy Agency (35367–1), the Swedish Research Council (621-2011-4388), the Kempe Foundations, and the Bio4Energy research initiative (http://www.bio4energy.se). In Finland, the Academy of Finland is acknowledged. This work is also a part of the activities of the Process Chemistry Centre at Åbo Akademi.